Grouplove‘s journey has been a short and fast climb to the top with one of their first songs, “Colours,” gaining huge amounts of attention. When their debut album, Never Trust A Happy Song, was released, they surpassed all expectations eventually resulting in their songs being used in commercials, shows, etc. Not to mention selling out their own headlining tour in just about every city it stopped in. The band is sure to see the same amount of attention, if not more, with the release of their sophomore album Spreading Rumours. The songs’ formulas continue in the same indie pop rock stylings, but also flirt heavily with electronica sounds. Opening track “I’m With You” starts with haunting piano keys that are then met with a drum and bass style beat when lead singer Christian Zucconi then begins to lead the track with his very unique and distinctive vocal approach. 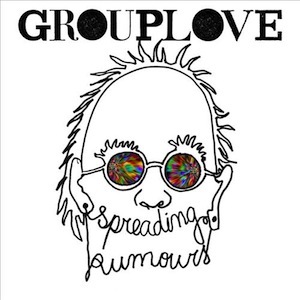 Similar to the their debut, the songs on Spreading Rumours have very little similarities to one another. Hannah Hooper’s increased vocal presence on this album adds a stronger sentimental feeling. Grouplove’s music is a perfect pick me upper, something to make you smile that can turn a gloomy day into a sunny one.